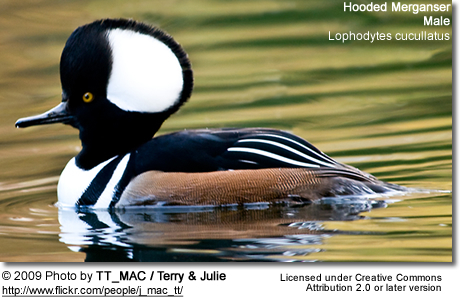 The Hooded Mergansers (Lophodytes cucullatus) are small ducks. 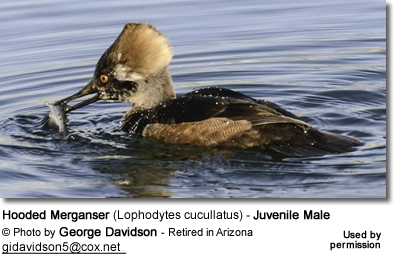 The Hooded Mergansers have a crest at the back of the head which can be expanded or contracted. Females have dark eyes. Males have pale eyes. 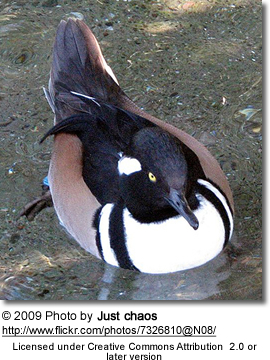 The adult male has a black crest with a large white patch. HIs head is black. His sides are reddish brown. 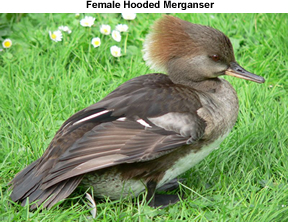 The adult female has a reddish crest, with much of the rest of the head and body a greyish-brown. 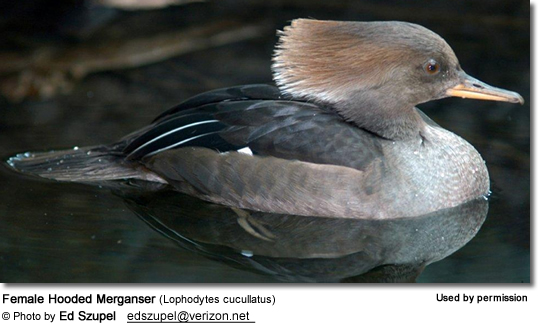 The Hooded Merganse has a sawbill - a bill with serrated edges that allow them to grip their prey. 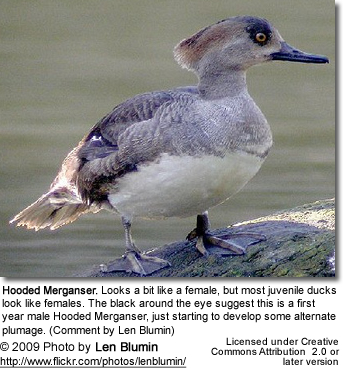 Juveniles look like females, but have grey-brown necks and upperparts (black on adult females). 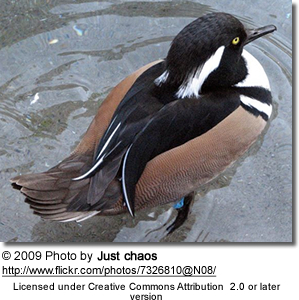 Hooded Mergansers breed in swamps and wooded ponds on the northern half of the United States or southern Canada; and winter in the United States wherever winter temperatures allow for ice free conditions on ponds, lakes and rivers. 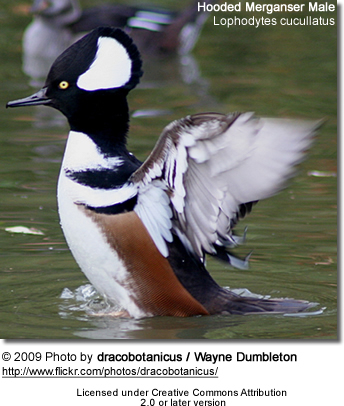 Although Hooded Mergansers are commonly kept in captivity in Europe, most records in the wild are believed to be escapes. A small number of them have, however, been accepted as genuine wild vagrants. 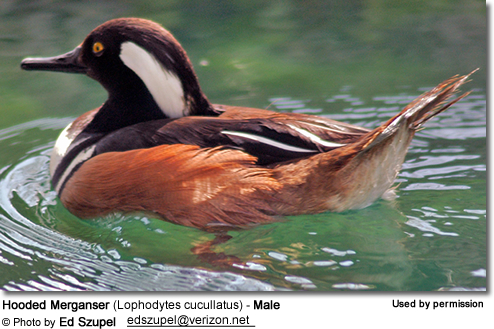 They form pairs in early winter and usually nest in tree cavities near water but will use Wood Duck nesting boxes if available and unoccupied. 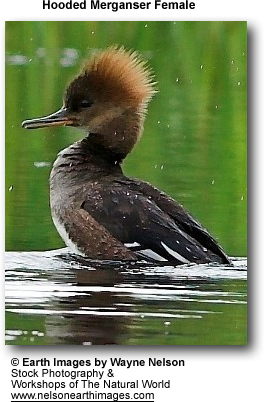 Hooded Mergansers feed by diving and swimming under water to collect small fish, crustaceans and aquatic insects.